One of my favorite places to find recipe inspiration is on food52 — a site created by two friends, Merrill Stubbs and Amanda Hesser, who wanted a place to showcase the best of home cooks. 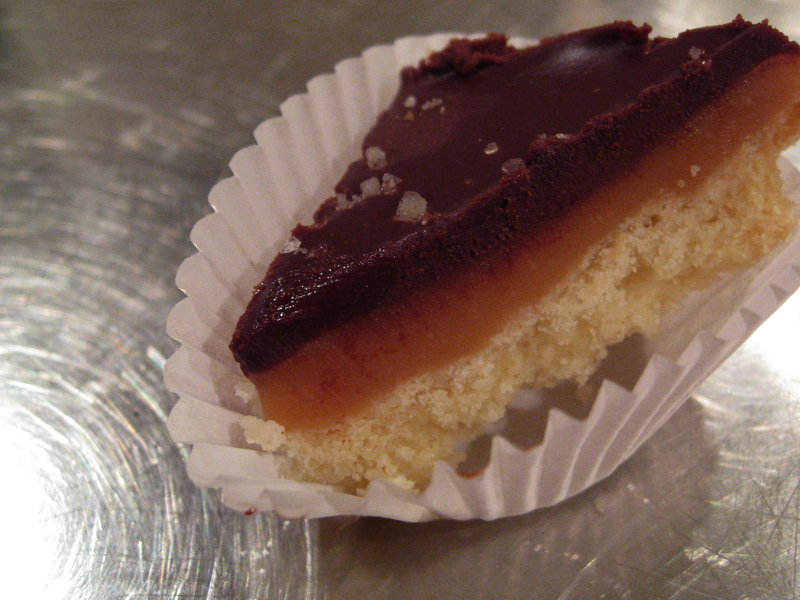 In looking for a winning holiday dessert that could easily be devoured in one bite while balancing a glass of bubbly, I came across Merrill’s recipe for Millionaire’s Shortbread. If you’re money hungry this dessert will sweeten the deal. It’s made with very few simple ingredients, can be made at least a day ahead of time and is worth its weight in gold when these little bites fly off the silver platter into your guests’ hands. Put a rack in the center of the oven and heat it to 350 degrees. Sift the flour and salt into a medium bowl and whisk in the sugar. Cut the butter into chunks and add it to the flour, stirring with a fork to make a soft dough. Gently pat the dough into a 9-inch square baking pan. Prick the dough all over with a fork and bake for 20 to 30 minutes, until it is golden and no longer looks at all wet. Set aside to cool while you make the caramel and chocolate topping. To make the caramel: Combine the sugar and water in a medium saucepan and set over medium-high heat. Bring to a boil, swirling occasionally until the sugar has melted but without stirring. Simmer for about 10 minutes, swirling the pot every once and a while, until the sugar turns a dark amber color. Do not let it get too dark, or it will taste burnt. As soon as the sugar reaches the right color, remove it from the heat and carefully add the cream, whisking all the time (the mixture will bubble up as you do this, so use an oven mitt or a long-handled whisk). Whisk in the butter gradually and then the crème fraiche. Set aside to cool for about 15 minutes, stirring occasionally. When the caramel is cool enough to touch, pour it evenly over the shortbread, tipping the pan gently and tapping it on the counter to get rid of any bubbles. Put in the fridge to firm up a little. To make the chocolate: When the caramel has firmed up a bit, bring the cream to a boil in a small saucepan. Off the heat, immediately whisk in the chocolate until smooth and shiny. Let the mixture cool for about 5 minutes, and then pour over the caramel, again tilting the pan and tapping it against the counter to smooth it out. Let it sit at room temperature for about 15 minutes, until the chocolate starts to firm up a little. To finish, Sprinkle the top with coarse salt and refrigerate until firm enough to cut into squares, at least 3 hours. When ready to serve, cut into 4×4 squares or cut each square in half diagonally to double the number of servings. These bites are so rich, I prefer to serve them this way and let the party come back for more. Mini Wild Mushroom Shepherd’s Pie w/ Scotch! I love Food52 too, the cookbook just arrived today and was meant as a gift for Christmas for Mom… I might have to find something else for her this year! This dessert looks great and I like the fact that there are no nuts (allergies). one of my favorite desserts! – was easy to make and not easy to eat the entire pan……….